Portraying two heart symbols, with the larger one bigger and in the front, the two hearts emoji is widely used to express love, affection, pleasure, or happiness. The two hearts emoji was approved in 2010 under Unicode 6.0. It is also referred to as small hearts and two pink hearts. Across platforms, the emoji features red or pink hearts, with one larger heart at the bottom or in front and a second, smaller heart up and off to the right or behind the first. The two hearts emoji is one of the most widely used heart-based emoji, of which there are literally dozens. It is frequently paired with other heart emoji for emphasis, especially the red heart emoji or beating heart emoji. The two hearts emoji is used frequently in text messages relating to love. While it is a symbol of romantic love, it can also be used to show affection for other close relationships, such as with family and friends (e.g., I 💕 to the moon and back). Because it looks the hearts are floating, the two hearts emoji can sometimes more specifically convey the sense of love is in the air to represent a general romantic mood or atmosphere. On social media, those who show love or affection for someone or something often use the two hearts emoji by itself or with other emoji to convey warm, happy feelings (e.g., Happy birthday to my amazing sister! 💕🎂💋😊). 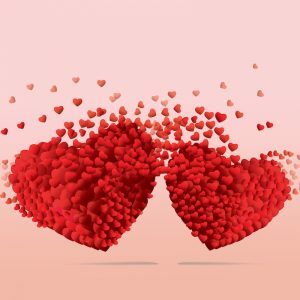 The two hearts emoji can also be used in a silly or sarcastic manner when referring to something that doesn’t usually excite love and affection (e.g., Who doesn’t love spring cleaning? 💕🌼✨🤣). On Snapchat, the two hearts emoji will appear next to a contact that has been your “#1 best friend” for two months in a row.